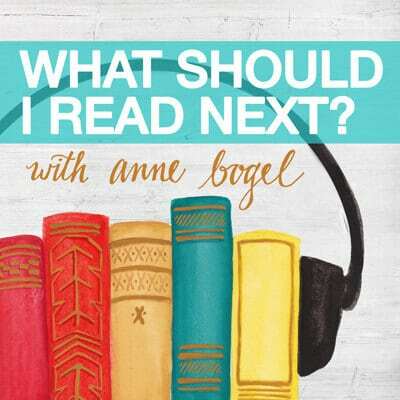 Announcing my new podcast: What Should I Read Next? I’ve been saying for a few years now that this would never happen, but now it has, thanks to a combination of outsourced production and magical thinking: I have a new podcast and you can listen to it today. It’s called What Should I Read Next?, and the idea came from the literary matchmaking series that used to run on this blog. In that series, readers would tell me 3 books they loved, 1 book they hated, and what they were currently reading, and I would recommend 3 books for their TBR list. I loved the series but found myself wishing we could talk about their picks before I made any recommendations, and wishing there was an easy way for us to do that. I finally realized that a podcast was the perfect forum for the bookish conversations I’d been dreaming of. This new show is dedicated to book talk, reading recommendations, and literary matchmaking. Every week I’ll talk all things books and reading with one guest, but the ultimate goal is to help YOU find your next read. Please help me spread the word so we can connect with our fellow readers and podcast fans! Subscribe to the show (details below), leave a rating in iTunes, follow the show’s new instagram account. This has been so much fun so far (even though I still have so much to learn!) I’m looking forward to many happy conversations to come about all things books and reading. If your device isn’t terribly old (not more than 3 or 4 years), the podcasts app comes pre-installed. Click on the little purple podcasts app icon to open. Tap “search” in the bottom right corner of your screen. 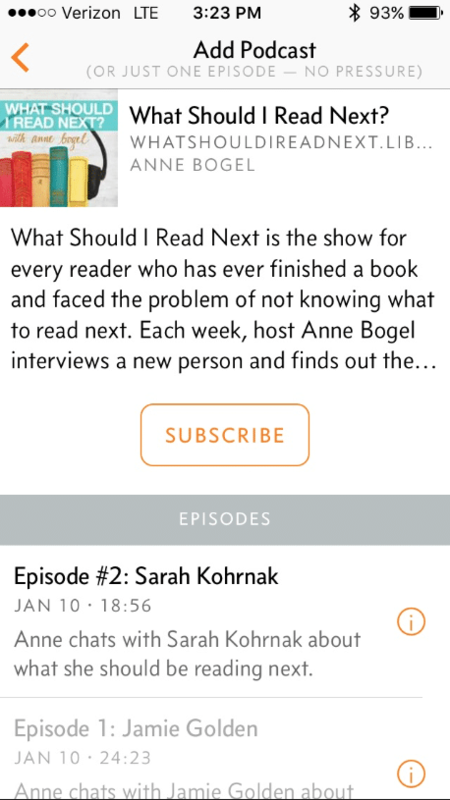 Then type in your podcast name (e.g., “What Should I Read Next”). When it returns your results, click on the square icon for the podcast. To subscribe using my favorite free podcasting app, Overcast. Tap the “+” button in the top right of the screen to add a podcast. 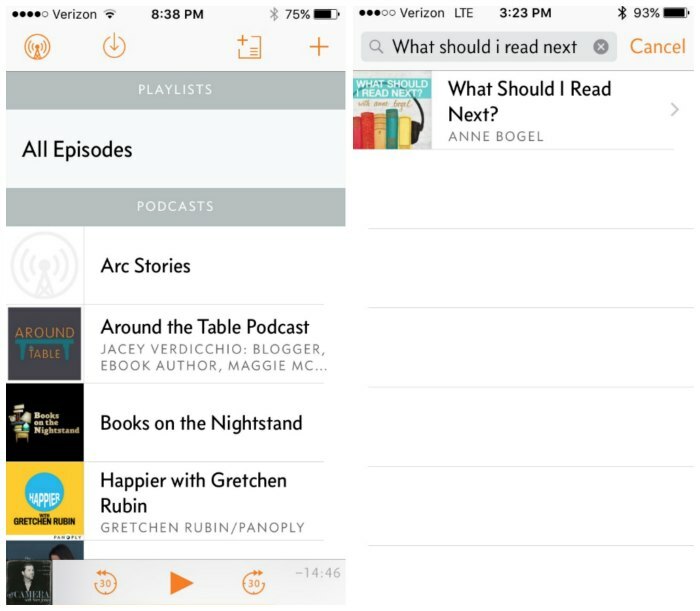 Type the name of the podcast into the search bar (e.g., “What Should I Read Next”). 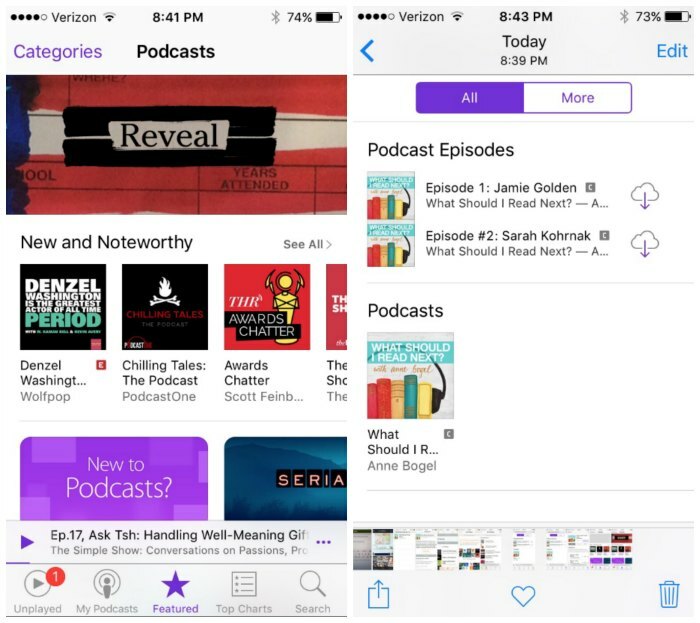 After the app generates results for your search, tap the desired podcast. Go to the show’s iTunes page, (e.g., What Should I Read Next? is right here). Click “view in iTunes” under the podcast’s colorful square icon. This will launch a new window. Click “subscribe” under the podcast’s icon. That’s it! Thank you for reading, and thank you for listening! Next:3 things I’m not doing in 2016. This is great!! Can’t wait to listen to it!! Thanks for the easy directions Anne! Can’t wait to listen! I’m so excited! Just this morning I was searching for new podcasts to listen to and was wishing that you had one! This is so exciting!!! Can’t wait to listen and find even more great books to read!! Congratulations! Our church started producing a weekly podcast and I am surprised at how much I am enjoying the whole process, from creating content to producing the end result. Fun! I will be cheering you on and listening with great interest! So happy to hear this!! ? Congratulations Anne! Glad to hear you’re enjoying the process. I can’t tell you how excited I am about this!!! I’ve been binge listening to the podcasts on which you’ve been a guest. This will be so fun! This is amazing news! I am an android user, and I want to let other android users know that an easy way to subscribe to your podcast is through the app “Podcast Addict.” Rather than ask you and other podcasters to post to stitcher or soundcloud, I’ve been using this app instead — it’s a simple rss feed-based service that is easy all around. I can’t wait to listen to the podcast! Thank you for the app suggestion. I was sad not to see it in stitcher. Whew! I don’t use iTunes and still listen to most podcasts via mp3 downloads, but use Stitcher for the few that don’t have a manual/RSS download option, so this is great. Congrats! With all the book talk with the award winners the timing is perfect! Never mind. I switched to the podkicker app and found it with no problem. Eager to listen! Excellent news! What a fun idea for a podcast. Very exciting! But I’m on vacation so have to wait til I get home to listen! This is great news! Just subscribed – can’t wait to listen! I always love hearing you as a guest on other podcasts, and I love the literary matchmaking you do, so I am sure this will be awesome! I’m excited…I’ve just heard you on three different podcasts and was wishing you had a podcast of your own. Best wishes to you as you take on this new endeavor. How exciting!!! I would totally be on it. ? Listened to you on the Lunch BreK thing last night & enjoyed it. This sounds great! Can’t wait to listen! Oh, I’m so very excited to tune in! I have to agree that I’ve been wishing you had your own podcast after hearing you as a guest on others! The first episode is with Jamie Golden!!!! I am so excited and going to clean quite happily today! I am more than mildly obsessed with the Popcast. Even after I found out Knox went to the rival high school of the one where we live. 😉 So I am solidly #TeamJamie. Listening right now! So excited. I’ve never listened to many podcasts and the few I have listened to made me wonder what the fuss was all about. But oh my goodness. I just finished listening to your first one and LOVED it! I’m always always looking for books to read and have a (very long) running list of books in my OverDrive queue. I already know these podcasts will become a regular feature of my week. Your recommendations are the ones I trust most. Thanks so much! Sneaky, sneaky!!! I had to refrain from cheering out loud when I saw yourannouncement on FB! I am sooooo excited about this and for you too! Way to go for it. I think it’s safe to say that we’re all going to love it! Exciting! I also couldn’t find it on sticther. I couldn’t get the Overcast app to work. Check out Gretchen Runin Happier pod cast page she makes it easy to listen whether on Android or Apple. Anne, any chance you could post a link to Overcast? When I searched for it in the Google Play store, three different apps with that name came up, and I’m not sure which is the “good one”. In the app store it’s called “Overcast: podcast player” and it’s by Overcast Radio, LLC. Congratulations Anne! I can’t wait to listen. My daughter got me a wireless speaker for my iphone for Christmas so I can listen to podcasts when I’m cooking. Congrats! I just downloaded the first two episodes. I’ll listen to them tonight and tomorrow during my commute. I’ve listened to the two episodes, loved them both! Left my review on iTunes! Very excited for this! Best of luck!! THIS. IS. AWESOME!!!!!!!!! I can’t wait to dig in!! I LOVED the conversational version of this that you had on Read Aloud Revival and I am looking forward to more! This is going to be great! I see you’re keeping them short, 18, and 24 minutes. Please, please don’t go over the 35 minute mark. It’s too long for a podcast, and so many are between 45-70 minutes long and they are TOO LONG. Yay for short, lovely, and concise podcasts!! Keeping it short is one of my big big goals! When you posted last week about 2015 being the Year of the Podcast, I was sure you were announcing YOUR OWN podcast. I was sad that I was wrong. But now I’m so happy!! I’ve listened to all your interviews on other podcasts, and I’m thrilled to have ready reading recommendations from now on!! Best of wishes!! Ahhhh! I’m so excited! I have recently started listening to podcasts, mostly at your recommendation. I run on the treadmill quite often, so this will be perfect! Woot! Best news I’ve heard in a long time. I had a sneaky suspicion you were going to do this! YES!!! This is amazing news! Oooh, this looks like a podcast I will really enjoy!! Going to subscribe now. Super cool! Downloading one and two. I listened to both one and two while doing my Declutter 500 things in 14 days challenge with moneysavingmom today! Loved it. Thank you! So excited about this! I binged listened to the two episodes and I look forward to the future ones! Well, I just switched to overcast (great advice) & have gotten emotionally involved in Start Up (also great advice.) I just subscribed to your podcast. You’re starting to have a scary amount of influence in my life! I like all of your recommendations! Congratulations & have fun with this new adventure! Excellent podcast! I liked hearing the process behind choosing the books. Your voice is very soothing…I think you need to read me bedtime stories at the end of stressful days. I installed a podcast app for the first time, in order to subscribe to your new podcast. Thanks for the how-to’s. Good luck and best wishes! 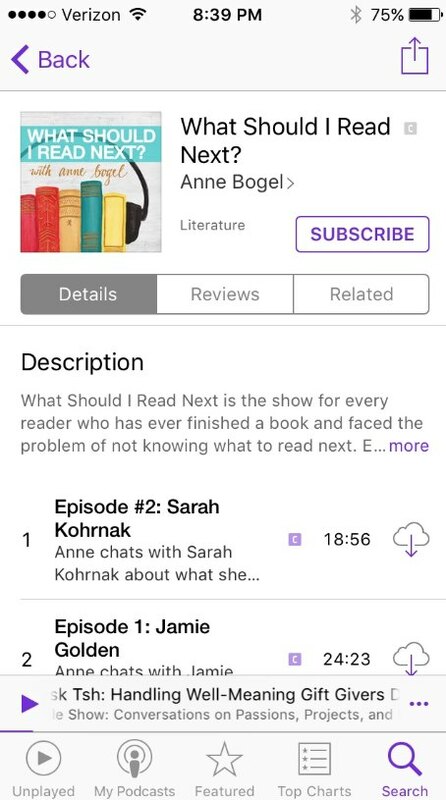 I immediately subscribed and listened to both delightful episodes — so glad that you are mentioning different books even though both ladies mentioned liking the same authors. One very small suggestion about dealing with the Jane issue — perhaps you could change your questions to include a favorite Austen novel or request that they exclude Jane Austen from their list of authors? Otherwise, you may effectively be working with only 2 authors instead of 3. Here’s hoping that you may be able to use civilians on the podcast eventually and not only other bloggers. Wishing you much continued success! But, I did share it on FB and pinterest 🙂 This is a fun Readers Advisory! I’ve subscribed and am looking forward to making the time to listen to the two episodes already waiting on my iPod, thanks! Wahooooooo! Best news I’ve heard all day! Just listened to both podcasts and it is a great format. I hope you consider different age groups, vocations, geography, etc. You have an appealing knack for coming up with unique angles. I look forward to this avenue you are providing. Thank you! It is wonderful to “eavesdrop” on a conversation as to why someone likes or dislikes a book, genre or author and it is really helpful in sizing up what I may want to read next. AND, if I forget a title, I’ll be right back here for it. Thanks! Thanks for the feedback. And YES to planning on chatting with a wide variety of readers! Congratulations, Anne! I’m so glad to see that Literary Matchmaking is taking on a new life. I’m listening to episode 1 as I write this (and look at cable alternatives…ha!). One question- how do you pick guests for the show? Is it based on those who “applied” for the matchmaking? Or is there another way you choose guests? I’ll have more info on being a guest on the show soon! I’m sure of one thing: I want to feature a wide, wide variety of readers. 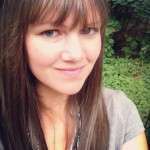 I’m new to your blog and absolutely LOVED the podcasts! Can’t wait for the next one. My only suggestion (or request) would be watch for spoilers? I know there haven’t been many and also they were from well known classics, but being from another country, I did not read many of the classic american novels, so many of the information given might be spoilers to me or to other people… I know it might be difficult to talk about a book without giving some information away but it’s just something I wanted to put out there. And I did pick up “To Kill a Mockingbird” because of your blog and podcasts, so thanks for that! Just listened to episode 1 and I just want to say THANK YOU! This is exactly the kind of conversation I love, so it was such a treat to listen to on my morning commute. Cannot wait to hear more! This is the BEST NEWS ever! Congrats! Also, your voice. It is SO soothing. I listened to both episodes back to back. Can’t wait for more!!! But the real question is – how do we get to star on the show? Listened for the first time ever and loved it! You have such an awesome radio voice, too. Clicking on the RSS feed link should open up the podcast in any podcast app. If that doesn’t work, ask a techie friend to add the RSS feed to your podcast app. I have to add my congratulations! I’m so thrilled – You’ll be perfect for this! I just subscribed and can’t wait to listen! Hi! I just started listening to your podcasts and so far I’m really enjoying them. And now I found my way to you website. Yay! I just have one question: can you do anything to equalize the volume between yourself and your guest on the podcast? I have to change the volume depending on who’s talking. But that’s really a minor complaint. Thanks for the show! I love, love, love your podcast! Keep it up! It’s such a great platform to hear different people’s perspectives on a lot of books in a straightforward way. What other literary podcasts do you listen to or recommend? I like Books on the Nightstand and The New Yorker fiction podcast. I am a portuguese listener of your podcast and i love how you connect with your guests. 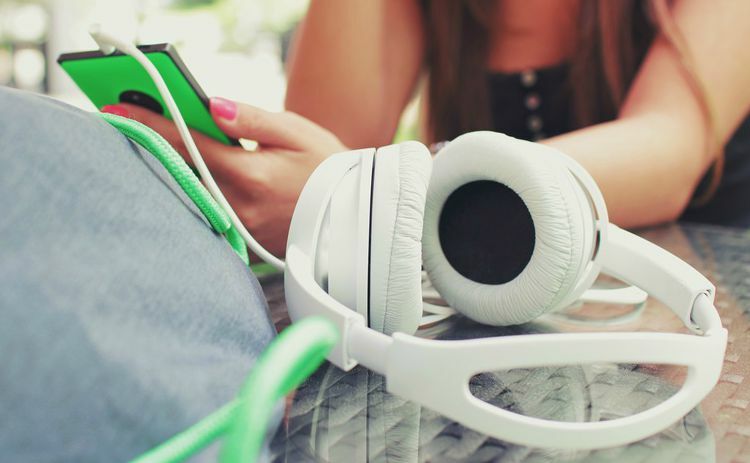 I am a blogger – a fairly new one at that – and i am tempted to try podcasting. Have you ever considered having a foreign listener´s WSIRN episode? Congrats on your great podcast! First of all I L.O.V.E. your Podcast! I just discovered it a couple weeks ago and have been binge listening. It’s fantastic and some of my favorite minutes of the day. I was wondering if there is a running list anywhere of the books that have been recommended? Oftentimes I’m listening in the car so I don’t have the ability to jot down books I want to try and then when I get time to go back and sift through the shows I’ve forgotten which one it was. I don’t know if you ever travel north, but there is a beautiful independent bookseller, in a historic brewery building that has been turned into a historic hotel, boutique shops, a beautiful salon and excellent local restaurants. I would LOVE to have your podcast come to Duluth, MN and launch out of the Bookstore at Fitgers. http://fitgers.com/ Summer and Fall are beautiful times to visit! Thanks for everything you do for all of us bookworms out here! I came a across your podcast a few weeks ago an I feel like a whole new world of reading opportunities has opened up for me! I love your style and your delivery of topics. You have a great voice for podcasts, not to mention your laugh! Thank you so much for creating this amazing podcast and for developing your wonderful website. I’m a teacher from Toronto Canada who has just begun my summer holiday which I now call “My Summer of Reading”. I’ve downloaded some of the sheets from your reading journal and have turned them into my own version. I’ve also started to listen to a few other reading podcasts … so much reading … never enough time! Hi! I’m just discovering this podcast and want to sign up. Is that possible with an Android phone? Or only with I-phones. Thanks. You can listen wherever you get your podcasts—or if you’re not typically a podcast listener, right on the podcast site for each individual episode (the latest is http://whatshouldireadnextpodcast.com/104 ) or on Spotify. Hope that helps!